Buy Biona Organic, Dairy Free, Wheat Free, Vegan Dark Chocolate Spread in the UK from our online shop or directly from our independent Scottish store. A delicious vegan chocolate spread suitable for children and adults alike! Try mixed into cake icing or as a topping on toast for a tasty treat! Organic, dairy free, lactose free, wheat free, vegan chocolate spread. May contain traces of nuts (hazelnuts, cashew, macadamia, almond), milk and lupin. As official Biona stockist, we sell genuine Honeys, Jams & Spreads directly from our shop in Scotland and online throughout the UK. Where can you buy real Dark Chocolate Spread - Vegan safely online? 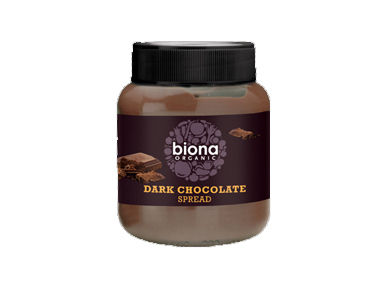 If you are wondering where you can buy Biona Organic, Dairy Free, Wheat Free, Vegan Dark Chocolate Spread safely online in the UK, then shop with us. We are an actual health foods shop; with real people selling real foods and products. Our award-winning independent shop is located in Stirling, Scotland since 1976. You can buy our Organic foods suitable for vegetarians and other genuine Honeys, Jams & Spreads in store or safely place an order with us online or over the phone. Dark Chocolate Spread - Vegan - Biona Organic, Dairy Free, Wheat Free, Vegan Dark Chocolate Spread in Honeys, Jams & Spreads and Foods.